Anderson joins Anderson Benson from Willis Towers Watson where she most recently served as a client service specialist. In her previous job, she was responsible for maintaining and responding to clients for businesses across the country. Anderson has served as a mentor to new employees throughout her career. Russell comes to Anderson Benson from Marsh McLennan Agency where she worked as a commercial lines accounts manager. She has vast experience with a variety of insurance and risk management needs for businesses. Leadership Franklin announces Ralph Drury, founder and CEO emeritus of the Drury Group and community volunteer, has been named the 2018 recipient of its Directors Award. Julian Bibb, Leadership Franklin board chair, Ralph Drury, award winner, Caroline J. Cross, Leadership Franklin founder, and Paula Harris, executive director. Drury, an insurance professional, has been active in the community. He is the founding member of Mercy Children’s Clinic, Franklin City Club and The Hundred Club of Franklin. 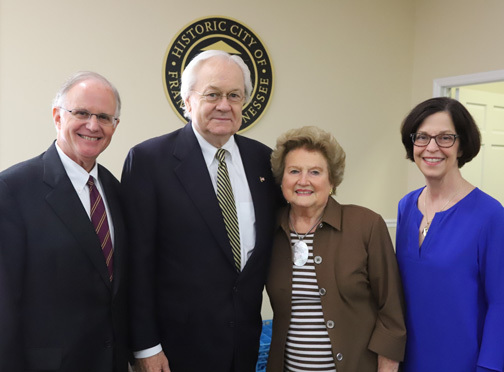 Drury is a member of the Williamson Inc. and past board member of numerous organizations including the Downtown Franklin Association, Williamson Medical Foundation and Heritage Foundation. In 2001, Drury founded A Vintage Affair, a nonprofit organization that leverages boutique wine and spirits to raise funds for local charities in Williamson County which has raised more than $1.5 million for organizations benefiting causes relative to local women and children. In addition, AVA has contributed $600,000.00 to equip the Neonatal Intensive Care Unit at Williamson Medical Center and the new adjoining Monroe Carell, Jr. Children’s Hospital Vanderbilt since 2005. Leadership Franklin also announced the graduates of its 2017-2018 Class. Crosslin welcomes Dianna Hester and Marie Scarboro to its accounting and business solutions and tax teams. Previously, Hester worked for more than 25 years at Procter & Gamble Manufacturing Co., most recently as a general ledger accountant/budget and forecast analyst. She received her bachelor’s degree in business administration from Middle Tennessee State University and completed several additional accounting courses at Lambuth University in Jackson. Scarboro has joined the operations team as an executive assistant in the tax department. Before joining Crosslin, she worked as an executive assistant at Nissan and also previously served as the office administrator for a charter school in Charleston, S.C. She received her bachelor’s degree from Belmont Abbey College in Belmont, North Carolina. Doug Word has been named director of regional development for the Tennessee Medical Association. He is responsible for managing county and regional medical society activities in designated areas in Middle and West Tennessee. Word will serve as staff liaison to TMA-chartered county and regional medical societies and help drive and support physicians’ efforts to increase medical society activities, improve member engagement and build and retain physician membership. Word joined TMA in 2014 as marketing manager with an emphasis on membership recruitment and retention. He will remain based in the association’s Nashville headquarters and deliver a range of management services including membership development, education and events, grassroots advocacy and administrative functions. Matthew Walker Comprehensive Health Center has announced its founder, Dr. Matthew Walker, Sr., has been selected for induction into the Tennessee Healthcare Hall of Fame. The induction ceremony will be held Oct. 16 at Belmont University. The Hall has been created by Belmont University and The McWhorter Society and is supported by the Nashville Health Care Council, a Hall of Fame founding partner. Walker was one of the first African Americans voted into the Nashville Academy of Medicine and was on the Board of Hospital Commissioners of Nashville General Hospital. He founded Meharry Neighborhood Health Center in 1968, which was later renamed Matthew Walker Comprehensive Health Center. Other 2018 inductees include Monroe Carell, Jr., John Henry Hale, M.D., Millie E Hale, Carol Etherington, M.S.N. R.N., F.A.A.N., Lynn Massingale, M.D., and William Schaffner, M.D. Dr. Fallon Wilson, CEO and co-founder of Black in Tech Nashville, is the winner of Nashville Cable’s Individual Power of Inclusion award. Nashville Cable is the premier leadership organization for women’s professional advancement. Wilson was nominated for her efforts to create more opportunities for diversity within the tech industry and to see more inclusion within the Smart City Planning Group board. She is also widely involved in the Tech Inclusion Forum and has been recognized at the local, national and international levels for her work in STEAM, STEM and tech. The winner of the Business Power of Inclusion award is Don Hardin Group because of its long and storied history of diversity and inclusion within the company. The Not for Profit Power of Inclusion award winner is Thistle Farms, serving women who are healing from prostitution, trafficking and addiction. Bradley Arant Boult Cummings LLP announces 29 attorneys in the firm’s Nashville office have been highly ranked in Tennessee in the 2018 edition of Chambers USA. In addition, Nashville partner William F. Goodman, III was ranked nationally for his products liability and mass torts practices.